Back in 2012, I somehow found myself on a Hercules NZ Airforce plane as an artist delegate along with the rest of a NZ delegation accompanying Prime Minister John Key to Samoa for 50th Independence celebrations. I delivered a 3 day music workshop at the National University of Samoa, as well as showcasing Hip Hop production at the Vanya Taule’alo gallery, making a beat entirely out of nature samples recorded around the islands. Something new sparked in me being back in the motherland on that trip; on previous trips over as a kid with the family, I admittedly had no real interest in, connection to, or understanding of any of the cultural practises and customs that I saw. It was just part of the background to the fun stuff. I returned from this trip super inspired, with a new found interest in exploring ways to integrate more of my Sāmoan culture into the work I was creating, which at the time was mostly local South Auckland Hip Hop and some commercial radio music. Even though I’d been surrounded by the culture all my life at home and at the local Māngere Samoan Methodist church that my family attended, I never really paid any serious attention to it. I knew that I needed to actively research and learn more about it, feeling like I’d finally identified a part of me that was missing, something that would anchor me personally and artistically. During 2014, after attending an awesome Pacific Education Centre (PEC) cultural workshop, I attended an affiliate exhibition event out at M’Cauley High School's Cultural Fiafia Day at MIT Ōtara, where I again learnt heaps and observed one of the local boys, Sam, having his hand-tapped traditional Samoan tattoo done, called a "pe’a" or "tatau". At the time, I was creating the imaging music stings for Pacific Media Network (NIU FM & Radio 531 PI), and one of my ideas at the time was to sample sounds of the tufuga’s (tattooist's) tools tapping to turn into a beat for a jingle. I asked Sam if I could attend one of his home sessions that weekend so I could record some of these sounds. Cut a long story short, I went along, and although I got the recordings done, master tufuga Tuifasisina politely asked me to raise my ‘ie lavalava above my knee to see if I was traditionally tattooed. Upon doing so, and revealing that I wasn’t, he gave me permission to use the sound recordings, but added that he couldn’t fully respect any music I created out of it; it was just the ‘sound of it’ to me as opposed to the ‘feeling of it’ to those that had undertaken the painful journey. I returned home in a daze that evening, pondering this interesting observation about how one ‘feels’ sound. Around this time, I was fascinated with the idea of how rappers repping a crew battling other rappers was very similar to Sāmoan tulāfale orator chiefs repping their family and villages and battling other orators. Very similar situations that involved wordplay, competition, delivery and performance. I still felt like I had so much more to research and learn about Sāmoan culture to counterbalance my knowledge and experience of Hip Hop in order to do any fusion type project any justice. One evening in August, I saw on my Facebook newsfeed that a dope bass player that I’d gigged with before, Sale, had completed a cultural class now known as Aganu’u Fa’asāmoa 101 (AF101). I searched it up, enrolled, and headed along to the Ōnehunga Library one evening, armed with a portable mic recorder and a small Canon EOS M camera to see what it was all about. I immediately loved the content being taught, and before I knew it, the twelve week course was up and our class proudly graduated in front of friends and family, who also watched footage that I’d initially captured as research notes now also edited into a summary video. Eventually uploaded to Facebook, it went viral, resulting in immediate enquiries from a few overseas territories. Our class tutor, le afioga iā Tanoa'i Tai'ī Lofipō Reupena Michael Tanoa’i invited me to accompany him to Melbourne (Australia) in January 2015 to document their class, trialling a condensed week long version of the programme. 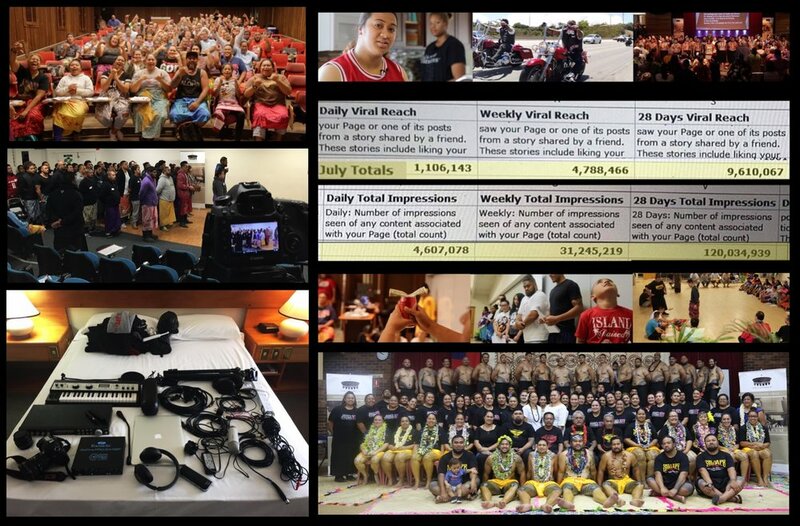 Cutting another long story short, the programme was expanded with the addition of le tofā ia Apulu Uta'ile'uō Tu’u’u Mary Kalala Autagavaia, and half of every year for the next three years was spent travelling to cater to national and international interest and demand. The programme hit five continents/ thirteen cities around the world (many cities numerous times), as I tagged along on many of the trips with portable studio and camera gear in tow, creating online content and resources, documenting this movement of a generation searching for identity and roots. I obviously also learnt a whole lot myself in the process. Mid 2016, I found myself alongside my colleagues Nanai Junior & Tuki Laumea in the waters of Ritidian Point, Guåhån (Guam), recording for a soundscape made entirely out of samples of the 12th International Pacific Arts Festival we were attending as part of the NZ delegation. It was surreal to be in a location embedded in the history of the indigenous Samoan MAU movement that had fought for Independence. It was the spot where I’iga Pisa came ashore after his monumental 1915 solo voyage across from Saipan, where he’d originally been exiled to by the Germans six years earlier in 1909 alongside the legendary Namulauulu Lauaki and other members of the original MAU leadership and their families. In early November 2017, I left the AF101 programme to focus back on music production and some new opportunities that had arisen. Taking stock of where I was now at, I launched a new company 37 Hz, and with a little more free time on my hands, started to plan what my next creative moves would be. I finally felt like I (1) now had enough of a basic knowledge and understanding of Fa’asāmoa to revisit the Fa’asāmoa - Hip Hop concept I’d had from years earlier, and (2) had honed the necessary skills required to facilitate large community involvement into a creative process. I made a submission to the Auckland Arts Festival's Whānui programme. They assessed and considered my proposal, and I was thankfully blessed with the green light. Over this past summer holiday, I’ve been slowly assembling a core lead artist and technical production team who I'm super excited to work alongside, some of whom I actually met on some of the adventures mentioned above! Last week, a volunteer participant call out promo video went out, garnering a great response back from community artists and participants also keen to be involved as well. All the pieces were now in place. I'm especially grateful to The Auckland Arts Festival, who through Creative NZ & Foundation North's Auckland Diversity Project Fund have allowed me this opportunity to finally realise the debut iteration of this vision in collaboration with the Samoan and Hip Hop community as part of their Whānui programme. Tonight, we all combine at the beautiful Fale O Sāmoa in Māngere, 6pm, to pay it all forward through the first creative workshop for this project - "4 THA LUMANA’I", which translated, means “For the Future”. I started my journey as a kid making beats in a Mangere, South Auckland bedroom, idolising and emulating the US Hip Hop music and cultural influence that dominated my environments growing up. What I do know is that we've only just arrived at the start line.